GM Don Waddell believes that his team is a buyer and can make the playoffs. I wholeheartedly agree with this, and will take it one step further and say the Thrashers are going to make the playoffs. Before I get ragged on for predicting this, hear me out. Yes, the Thrashers traded away Ilya Kovalchuk, arguably the best player the franchise has ever known, last month to the New Jersey Devils. Yes, the club also traded away goaltender Kari Lehtonen, a former 2nd overall pick that was supposed to be the future between the pipes for another decade. There also is no big-time “star player” on this team now, unlike in years past when Kovalchuk, Marian Hossa and Dany Heatley were always identified with this group. Evander Kane and Zach Bogosian have the potential to get there one day, but for now, are still learning the NHL game. However, there is a more cohesive group in place now. Even without a go-to player up front, Atlanta has a group of forwards that can score by committee. Nik Antropov, Rich Peverley, Maxim Afinogenov, Bryan Little, Kane, and newly-acquired Niclas Bergfors all have the capability to put the puck in the net. Sure, none of them are threats to hit even 25 goals this season, but Little had 31 last year, and Afinogenov has picked up over 70 points in a season before. Little and Kane have turned their game around and started playing well, right after Kovalchuk was moved. Bergfors has done well himself, picking up 4 points in 5 games before the Olympic break. Slava Kozlov hasn’t had the same impact as he did a year ago, and is hoping to get a fresh start elsewhere before the deadline. Ditto for Todd White, who has struggled to produce offensively, but will most likely stay a Thrasher. Marty Reasoner and Colby Armstrong are great role players on the third and fourth lines, while the newly-acquired Evgeny Artukhin will be able to provide a big body up front now as well. On the blueline, the club has a sturdy but unspectacular group. Tobias Enstrom is one of the top 10 scoring d-men in the league, while Bogosian, Ron Hainsey, Pavel Kubina, and Johnny Oduya provide solid depth. This isn’t even counting the signing of veteran Chris Chelios, who at 48 years of age, can still provide solid leadership and veteran experience for the defensive core. In net, Lehtonen hadn’t been a factor anyways, as Johan Hedberg and Ondrej Pavelec have done just fine without him. Sure, neither is a surefire #1 goalie at this point, but both do enough to get the job done for now. Finally, the real reason I believe that the team will be successful is because of the game schedule in March. 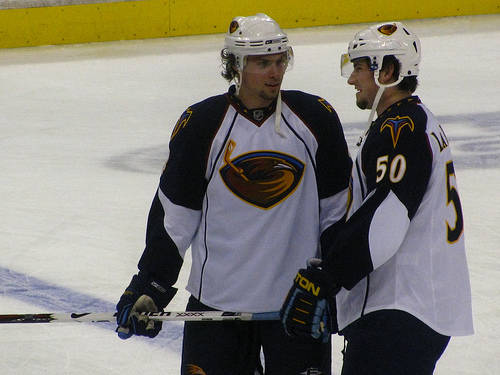 The Thrashers play a total of 17 games, of which 12 will be at home. Also, only 3 of those games are against teams that are surefire playoff squads (Phoenix, Buffalo, Ottawa). The rest are either against the worst teams in the Eastern Conference (5 games against Carolina and Toronto), or against clubs that are also fighting for their playoff positioning as well (Philadelphia, Tampa, Boston, NY Rangers). It was a good start tonight by beating the Panthers, and moving to within one point of a playoff spot. Expect this trend to continue, as the team is now 3-1-2 since trading Kovalchuk.